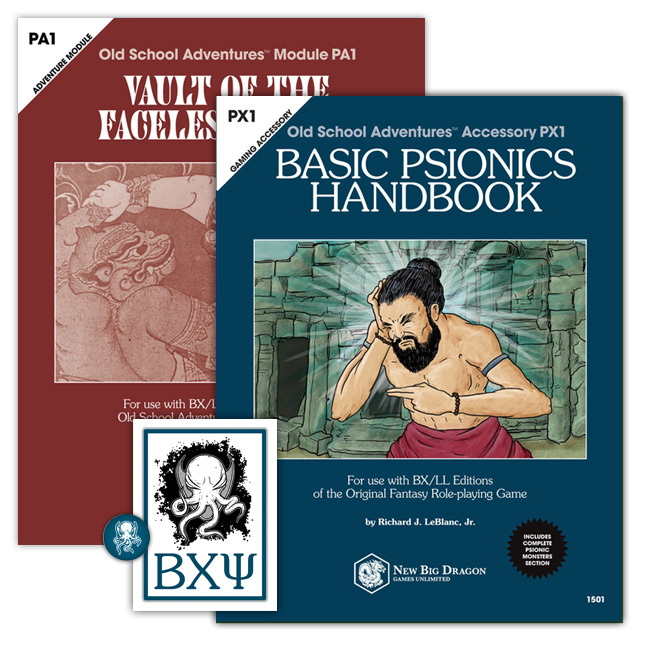 In looking at some developing/adding some new psionic monsters to the mix (especially with an eye towards what kind of psionic adventure I might run at NTRPGCon), I was considering the addition of some new treasure types to the B/X mix. Any feedback on these is appreciated. 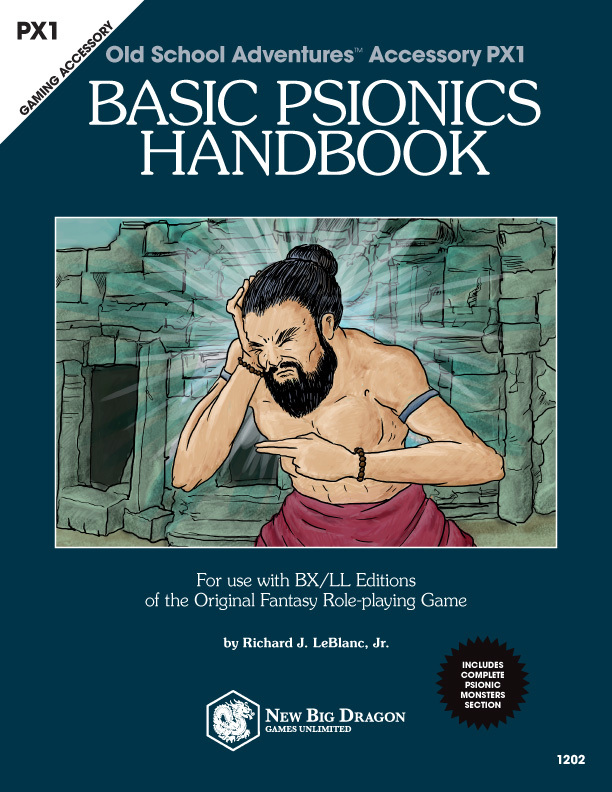 Basic Psionic Items Now Available in Print! If you live outside the U.S., or are looking to bundle purchases of these books with others, or you're using a Lulu.com coupon code, both books can be purchased at Lulu.com. 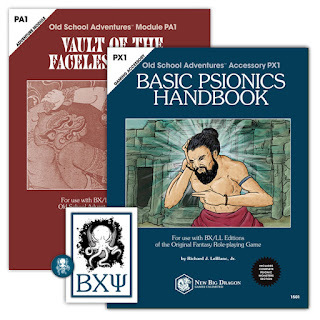 If you email a copy of your Lulu receipt (showing items purchased) to bxp@newbigdragon.com, I will do my best to send complimentary PDF copies of these purchases (fulfilled through RPGNow). (Please note the Lulu.com is unable to print on the inside covers of paperback books, so the map for Vault of the Faceless Gods appears across the center spread of the book in B&W). The Temple of the Rats was originally constructed in the name of the ancient goddess Inaenu (pron. in-NAY-new)—a goddess of fire and war whose followers and cults have long since disappeared. (The original name of the temple has also long been forgotten, for it was not “the Temple of the Rats”). It is held that the temple was once a place of great dignity, for the followers of Inaenu were stout warriors who feared little and killed many in her name. These warriors met their undoing, however, when they faced the armies of an evil leader known as “The Red Lord.” The Red Lord enlisted the aid of a powerful wizard who spread a fog of fear over the battlefield. The followers of Inaenu deserted the battle and came running back to the temple. Such a sin against Inaenu was punishable by death. She chose to spare their lives, however, but turned them into rats, and offered the temple as a future place to stay. They expressed their gratitude and pledged their undying allegiance to Inaenu. The goddess had no need of such cowards among her followers, so she left the temple to the abandon of its residents and it fell into disrepair. It was no wonder that Dabothuda, the demon prince of rats took the temple under his watch. And so, it became of place of evil. A fair number of adventurers have tried to rid the temple of its evil, but it is said that many of them were turned into wererats and now call the temple their home. In recent weeks, there has been a growing number of wererat raids on local villages near the temple. Given that so many of the villagers are being wounded by the wererats (and becoming lycanthropes themselves), it is likely that the creatures are growing in number and the temple is the center of this growing problem. Dabothuda, the demon prince of rats, resides on the 15th level of the Abyss—Choohon, a writhing and tunneled place of ruin populated by vermin of all types, but which is particular rife with rodents. It is rumored that Dabothuda keeps as many as 500 different lairs, each of which contains a chest holding 10,000 cp, and all of which are nearly impossible to find. Dabothuda has two different forms, either of which he may assume at will: 1) a giant black rat that walks erect, or 2) a massive black wererat (both forms stand approximately 10' tall). In either form, Dabothuda’s claw and bite attacks do the same damage. On any successful bite attack, Dabothuda’s victim must save vs. paralysis or contract lycanthropy; unless cured, human victims will become a wererat in 2d12 days, and non-humans will die. In either form, and in lieu of a physical attack, Dabothuda may opt to use a psionic ability or attack. Additionally, once per day, Dabothuda may summon up to 8 wererats to serve him. Dabouthuda is always surrounding by a sphere of darkness that extends to a radius of 15'. This darkness may not be dispelled by any magical or psionic means, nor may a light of any type (normal, magical, psionic or otherwise) even penetrate it. Additionally, the darkness effect negates all special vision abilities (e.g., infravision and ultravision), except for darkvision. Dabothuda, however, possesses a unique clairsentient minor devotion known as piercing vision; this ability allows Dabothuda to see in under any light condition to 120', as if there was no impediment whatsoever (including the interior of his own sphere of darkness). This ability is always on and costs no PSPs to use. Additionally, Dabothuda possesses the clairsentient major science psionic true seeing to a range of 120'; this ability is always on and costs no PSPs to use. Dabothuda is immune to poison, disease, and cold, and takes only half damage from acid, electricity, fire and gas. 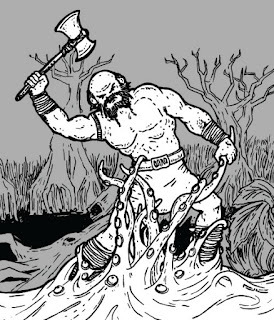 A magical weapon of +1 or greater is required "to hit" him, but Dabothuda is affected normally by iron weapons, silver weapons and magic missiles. This is a monster that I intend to include in PA2: Spawn of Xumaltet, the follow up to PA1: Vault of the Faceless Giants, and precursor to PA3: The Jahnu Prophecy. From the definite extraplanar bent these adventures are taking, you can probably tell this is all going to be related to the Basic Guide to the Planes. This is really going to play a big part in the Xumaltet adventures (yes, plural adventures). 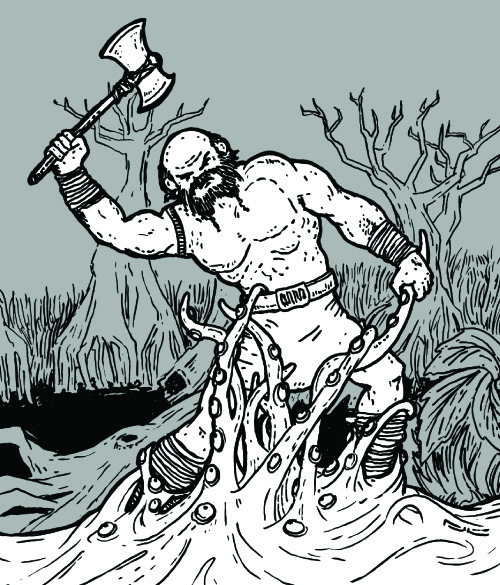 Xumaltet is really going to be more of a hex crawl as a module, with small self-contained (but very interwoven) adventures (the majority of which will be designed to play out within a single game session). Xumaltet will answer this question from Vault of the Faceless Giants... "Are there other planar rifts?" For now, that's all I'll say. These horrid creatures appear as a tentacled slime littered with staring eyeballs. The eye slimes were originally created by Juiblex to aid in his quest for dominance of the 99th plane of the Abyss. 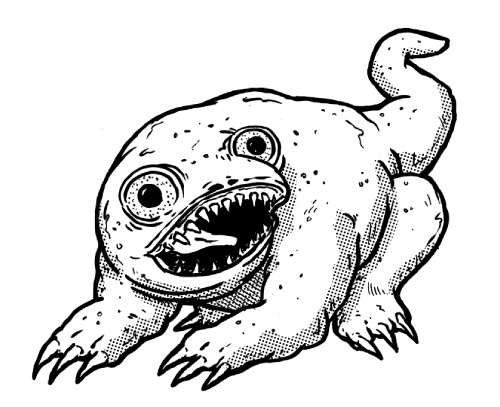 However, over the ages, many of these abominations have slipped into the Material Plane, mostly from the Slime Pits (the 457th layer of the Abyss, Juiblex’s home realm where they eye slimes are bred). In combat, an eye slime lashes out against a single opponent with a barrage of tentacles, doing 2d4 points of damage on a successful “to hit” roll. 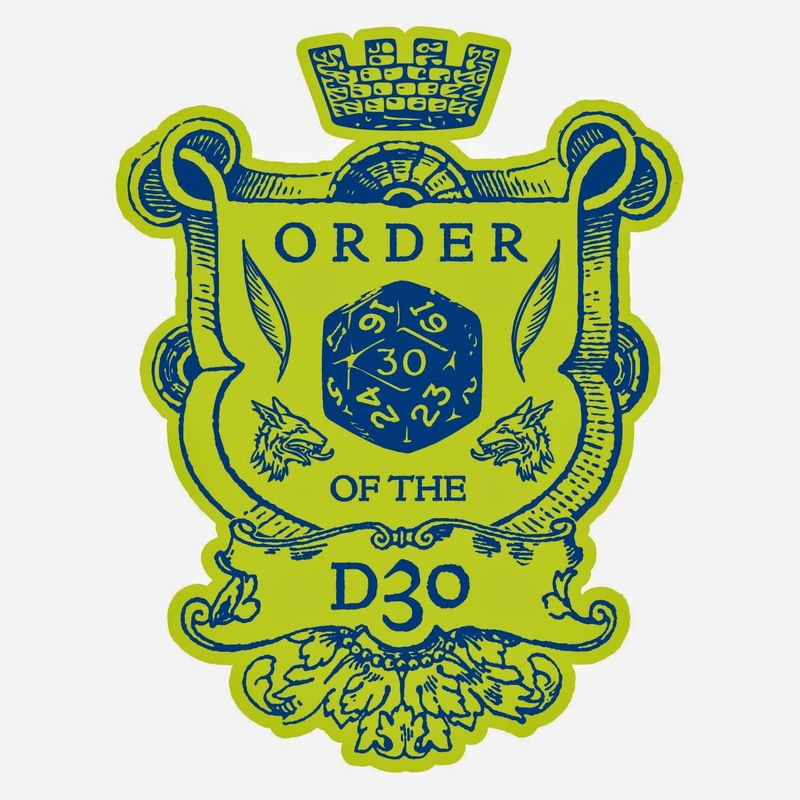 On a natural 20, the eye slime will succeed in grappling its opponent, and do an additional 1d6 points of squeezing damage. Every round thereafter, the eye slime will continue its hold, doing 1d6 points of damage per round until the victim or the eye slime is dead. A +1 or better weapon is required “to hit” an eye slime, and they take half damage from bashing weapons. Additionally, they are immune to acid and cold, though the latter will slow them to half movement for 2d4 rounds. Because an eye slime has 360° vision, it is never surprised except by invisible creatures (or similar), and thieves get no bonus for striking them from behind. However, an eye slime saves vs. blinding effects with a –5 penalty. The correct rendering of this name in Modern Welsh depends on the specific source. The Middle Welsh avanc of Llyn Barfog is afanc in Modern Welsh, a word which is now used to mean "Beaver". The form avanc/afanc is also used in the Red Book of Hergest and most other medieval sources. In the Middle Welsh version of Peredur's tale, in the White Book of Rhydderch, the creature in the cave is called the addanc. Afanc is by far the most common spelling. Most often found in temperate and sub-arctic lakes, the amphibious afanc (pronounced avank) appears as a cross between a beaver and frog-like reptile with claws on all limbs. These carnivorous creatures have an almost insatiable appetite. During combat, an afanc will usually make a leap as his first attack, striking with all 4 claws against a single opponent. Once engaged, the afanc will attack with its ferocious bite (1d6+1) or its 2 fore-claws (1d4 each). Afancs have a particular weakness for beautiful women. Any Charisma bonus for a female (of any human, humanoid, or demi-human race) is doubled in regards to an afanc’s reactions, while Charisma penalties for similar females are negated. Additionally, any saves the afanc makes vs. charms or charm-like effects originated by similar females are made at –2.